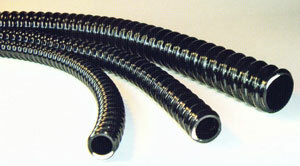 Brand Dielectrics now carries flexible nonmetallic convoluted electrical tubing. It comes in sizes from 1/4” thru 2” trade size. You can use it with straight or right angle connectors. It resists corrosion, oil and water. Featuring maximum flexibility, it can be used in extremely tight quarters and it resists abuse, pulling & crushing. Inside its smooth for easier wire pulling.